The International Society for Technology in Education (ISTE) conference was a lot of fun for our six year old correspondent Tatum F. As we were pulling out of Atlanta we asked what her favorite part of the conference was and she said robots and throwing iPads. The conference featured over 500 exhibitors with products designed for educational use and products designed for kids. As many schools across the country move to mobile devices and Chrome books, the need for truly kid friendly iPad cases has increased. Several companies were showing off cases that were designed to withstand the rigorous torture given to devices by young users. Earlier this year at the Florida Educational Tech Conference (FETC) we got a chance to see a drop test from Bump Armor. At ISTE Tatum got to try out Big Grips, an almost identical product to Bump Armor. While she liked the Big Grips case she said that it was “really big”. The Big Grips case is pretty big it’s about the size of an average high school text book. Of course it weighs much less, but the protecting foam seemed uncomfortable for a six year olds hands to hold for extended periods of time. Gripcase provides as much, if not more protection than Big Grips and the similar Bump Armor, but in a much thinner frame. The GripCase protects the iPad or tablet from pressure impacts that with some cases can protect the case but not the pressure shifts and can cause the tablet to break. That’s actually what happened when Tatum had an Otterbox case on her iPad mini. It one point in time she had accidentally dropped her iPad mini off of the cat walk on the third level onto the hardwood floor about 14 feet below. The case withstood the impact just fine, the energy transfer though, shattered the iPad screen. The GripCase’s protective foam absorbs the impact from such a fall and leaves the iPad intact. Now there’s not screen protection on the front of the GripCase, but it’s designed in such a way that in a forward facing fall onto the floor or ground, the iPad or tablet screen won’t actually touch the surface. Parents and teachers may want to get some kind of screen protection though to protect the screen from curious pens and pencils, and sharp impacts from desk corners and situations where the front of the device is going to be exposed. Gripcase told us that there’s definitely enough room for a screen protector and it won’t effect the Gripcase’s protection. Gripcase can be purchased here from Amazon. 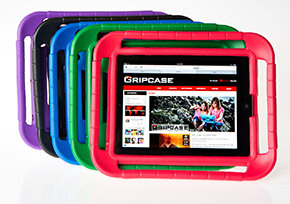 You can also find out more about Gripcase here at their website.